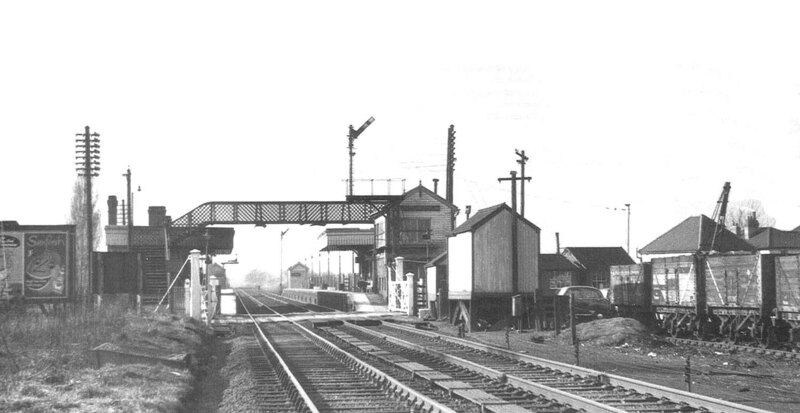 Looking north showing the level crossing, the signal box on the up platform and part of the goods yard on the right on 28th May 1955. In the grass verge on the left the top of a box can just be seen. This contained sand strategically placed to help trains restarting from the down refuge siding during wet weather, which lay just behind the photographer, by being spread on the rails to aid traction. Whereas the wire controlling the signals south of the station ran to the left of the up line, the rodding controlling the points lay in the 'six-foot', the area between the two sets of tracks.